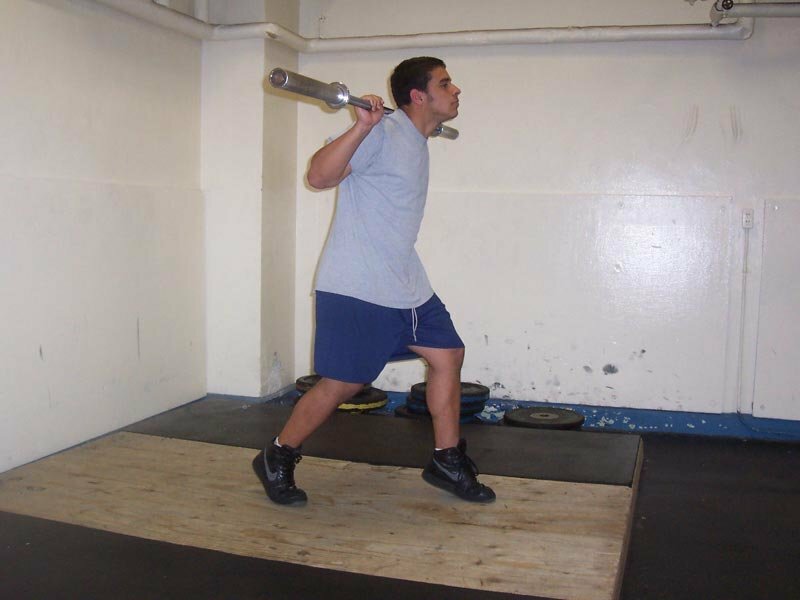 Here are 10 exercises for developing explosive strength and power for the sprint/jump athlete. 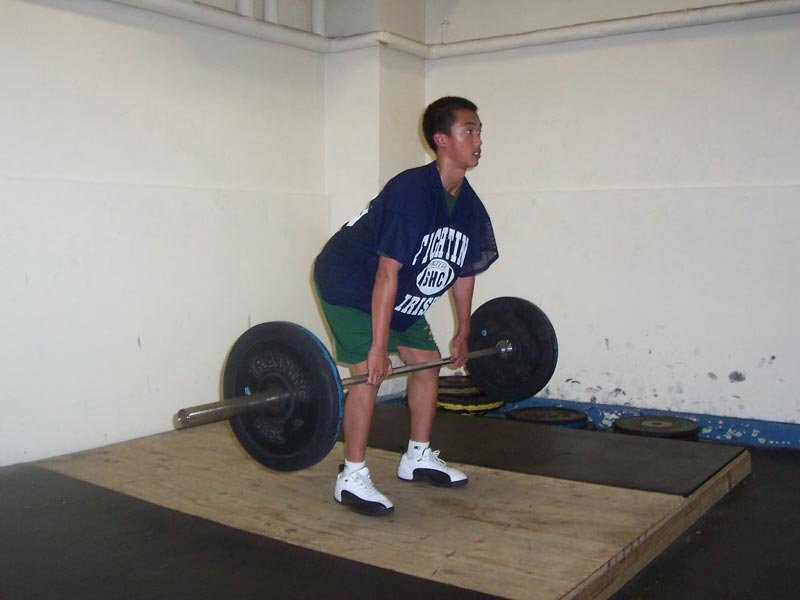 And they each tell you the same thing, “If you lift our way you will become more explosive.” Most of this confusion comes from a failure, by both coaches and scientists, to develop a theoretical framework for training athletes. This framework could be used to explain why some exercises and training methods are more successful than others. Another frustration for the strength coach is our inability to standardize basic words and definitions. “Explosive” and “power” are terms often used in exchange for each other. These two terms are related, but can be trained separately and are not always dependent on each other. Strength and conditioning studies usually focus on training methods and exercises that affect either explosive strength or power measures.1,2 These measures are tested to see if there is a relationship (correlation) with sprint and jump results. 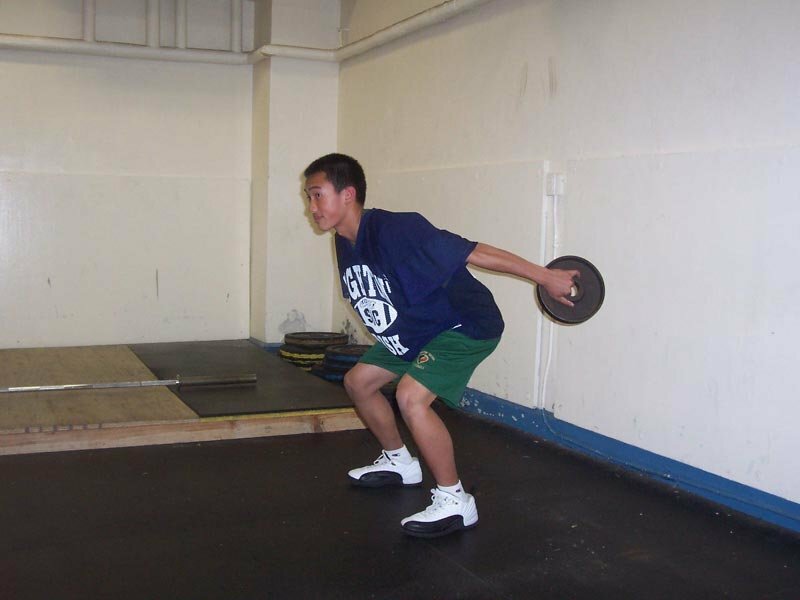 In sports, athletic movements need to be performed at high speeds. Fast movements such as sprinting and rapid jumps typically involve contraction times of 50-250 milliseconds.3 This presents a problem: it takes a longer time (>300ms) for muscle to develop maximum force. Since maximum force cannot be developed with fast movements, any increase in the rate of force developed in the early phase of contraction becomes vital. Explosive strength is defined as the rate of force development (RFD) at the onset of contraction.4 RFD is taken from the slope of the Force-Time curve (see Fig. 1). The goal of training for improved RFD is to shift this curve to the left (i.e. create more force in less time). In an isometric contraction (no movement), force can be developed quickly, therefore RFD can be high. Thus, the muscles have more time to create maximum force, which increases the speed of movement.6 In this example RFD is decreased in order to increase movement speed. If both RFD and speed of movement can be increased with training, performance will be enhanced significantly. We’ve all seen the definitions for Power, but many times they are not fully understood. Power equals Work/Time, and Work is the product of Force multiplied by Distance. Now, what’s important in this equation is the distance. The farther the distance a segment (trunk, upper leg, lower leg) travels, the greater the Work and therefore, the greater the Power. Table 1: Power And Explosive Strength Profiles. The countermovement dynamically stretches the muscle before the upward phase of the jump. This pre-working state can create a large amount of power, but RFD may not be as high. 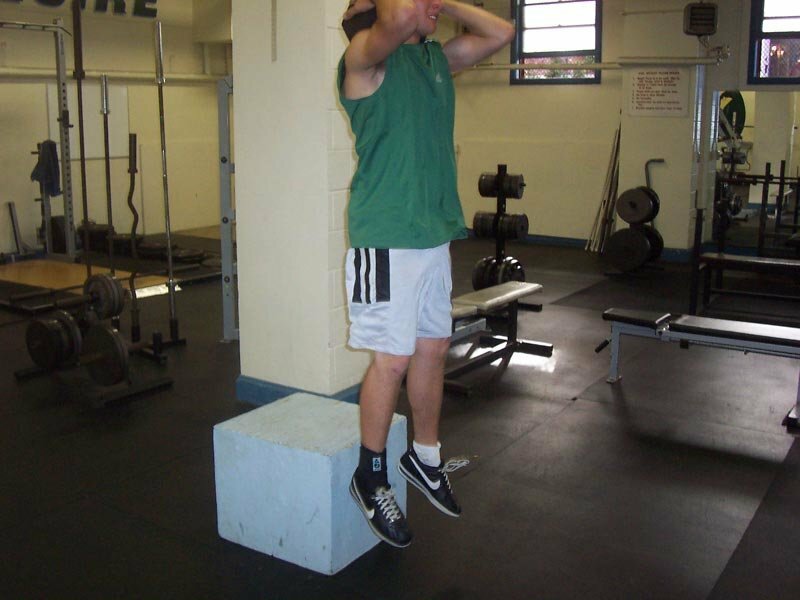 The “shock” method is utilized in fast stretch movements such as the depth jump. In order to increase an athlete’s ability to sprint and jump, training must be specific to sprinting and jumping. Maximum force output, explosive strength and power will not help the sprint/jump athlete unless they are performed in relation to the mechanics and coordination of sprinting and running. 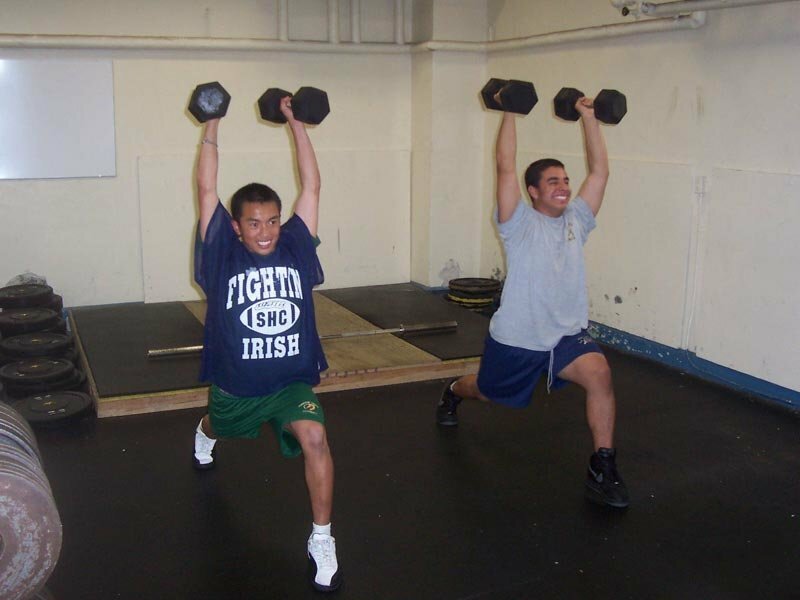 I didn’t include heavy exercises, high intensity plyometric or Olympic pull exercises (from the ground), which should be a part of any athlete’s program. I did this because those exercises are more specific to the sport, time of season and your training philosophy. 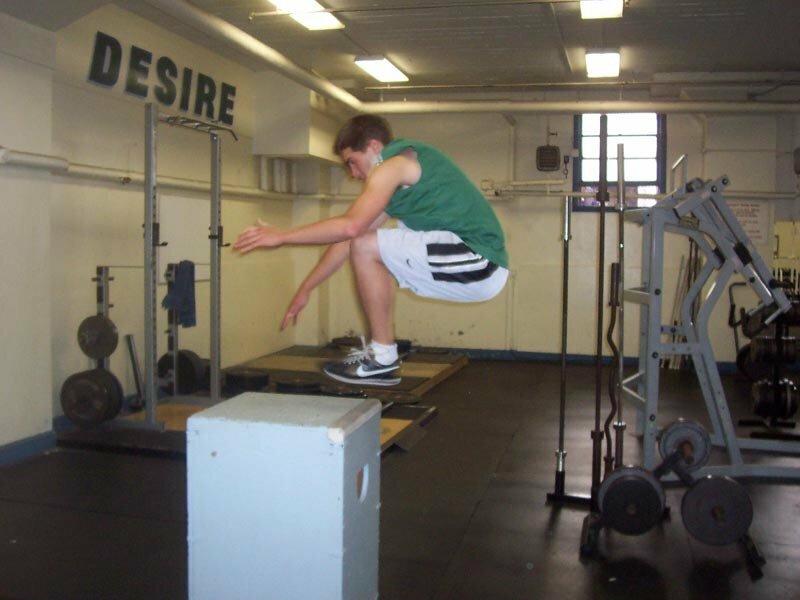 Add 6 Inches To Your Vertical Jump! Starting Position: Stand upright with a 10-pound plate in each hand. Execution: Swing the plates backward as you let your body bend downward in a countermovement. Next, swing the plates forcefully forward and upward as you begin the jump. It’s important to swing the plates all the way up to head level or higher. You can think of throwing the plates in front of you and letting the weight carry you. 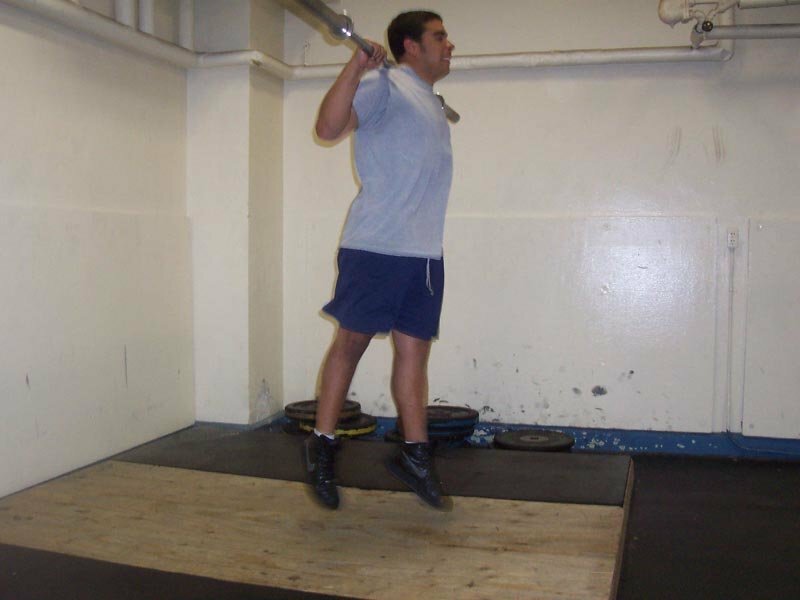 This exercise can be performed for 3 or 4 sets of 8-12 jumps. Starting position: Stand upright while holding one end of a dumbbell with both hands. The dumbbell will hand with the free end facing downward. Execution: On the descent let your arms relax and hang down. 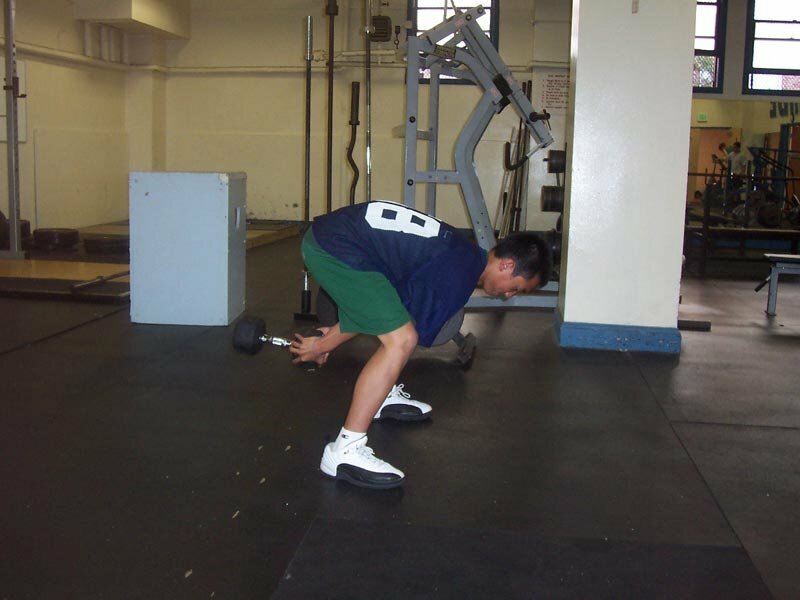 Squat back slowly, don’t allow your knees to travel forward, keep your lower back flat. 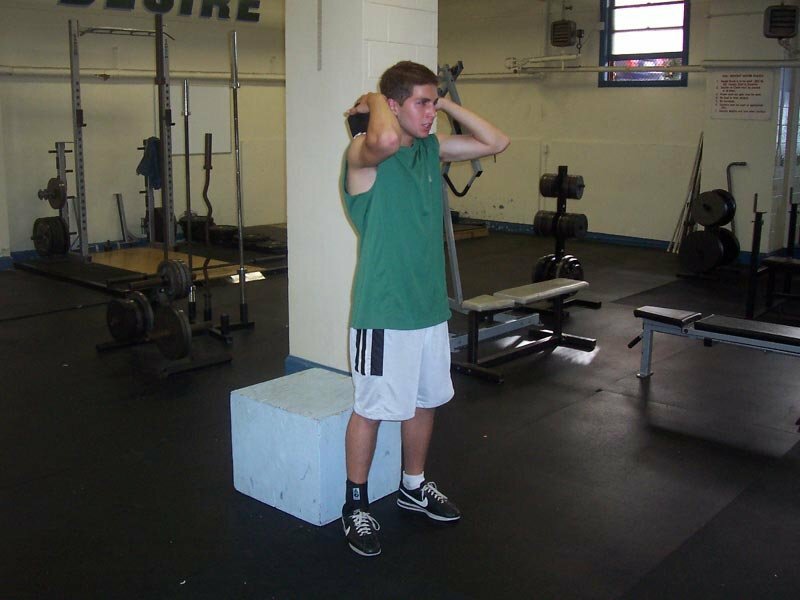 Starting position: Place a dumbbell across your shoulders. The elbows will be facing straight ahead with the fingers on top of the dumbbell. Execution: With the back of your heels placed against the box, sit way back onto the box. Do not round your low back on the box, keep a flat and tight lower back position. As you sit on the box relax your hip flexors, but keep everything else tight. From this position jump as hard and as fast as possible straight up. This exercise is a combination of the DB Swing and the Pull Through. You get a big stretch of the posterior chain before a powerful hip extension. It’s important to reach as far back as possible on the descent and to initiate the jump with the hips, not the arms. 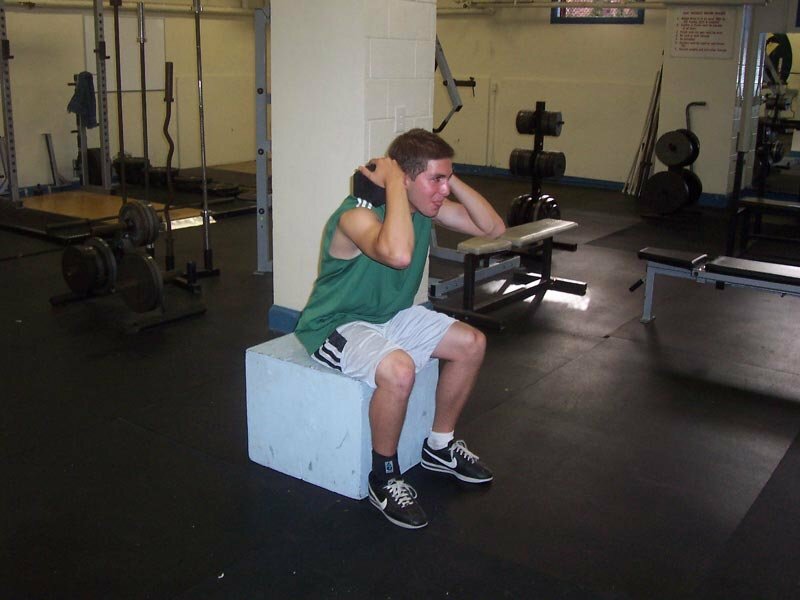 Starting position: Take a wider than shoulder width stance and hold a dumbbell in the same way as in the frog squat. Execution: Swing the dumbbell down and backward between your legs, drop your head and reach as far back as possible. The jump is initiated by throwing the hips forward and up, let the weight lag behind. The extension of the hips will speed up the swing of the dumbbell. 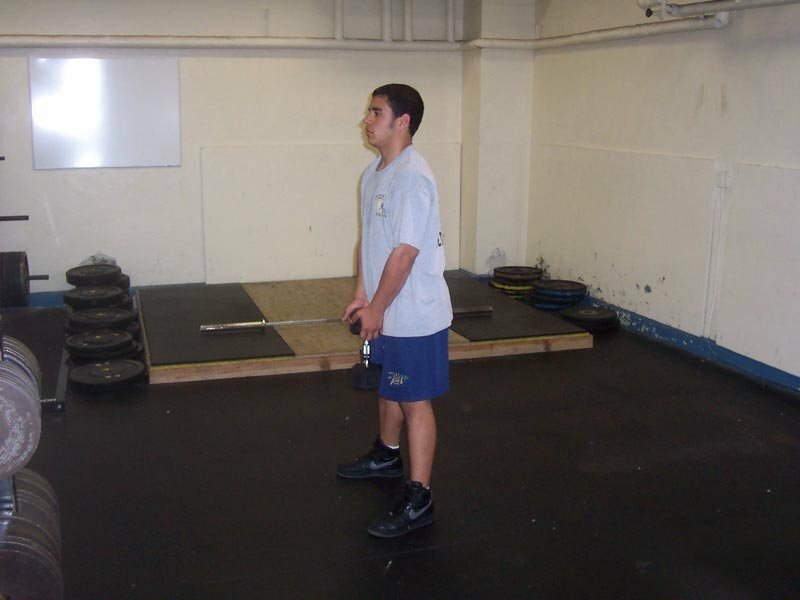 Execution: This exercise is the same as the traditional triple jump except you do not have an approach. 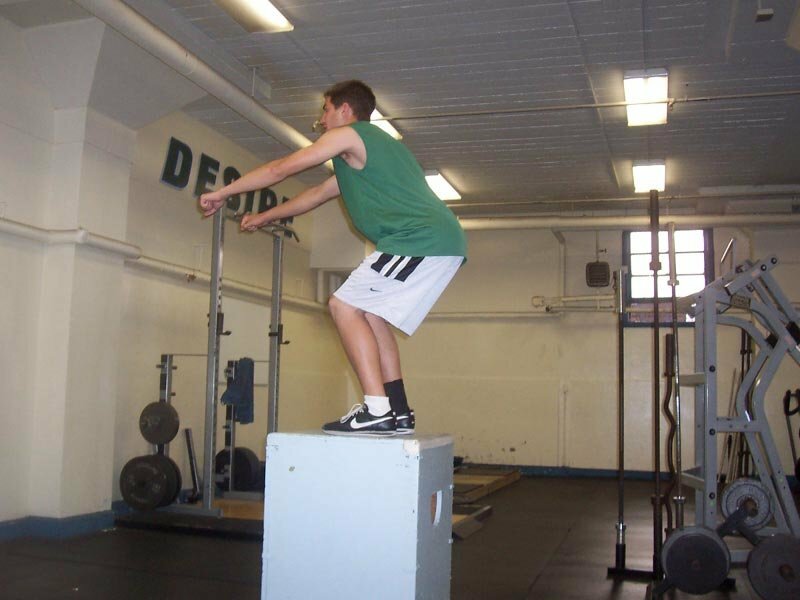 With a shoulder-width stance, start with a horizontal jump. Land on one leg, then jump forcefully forward. Next, land on the other leg and jump forcefully forward again, then land softly with both legs. Reset after each attempt. This exercise can be used as a training exercise or as a test. 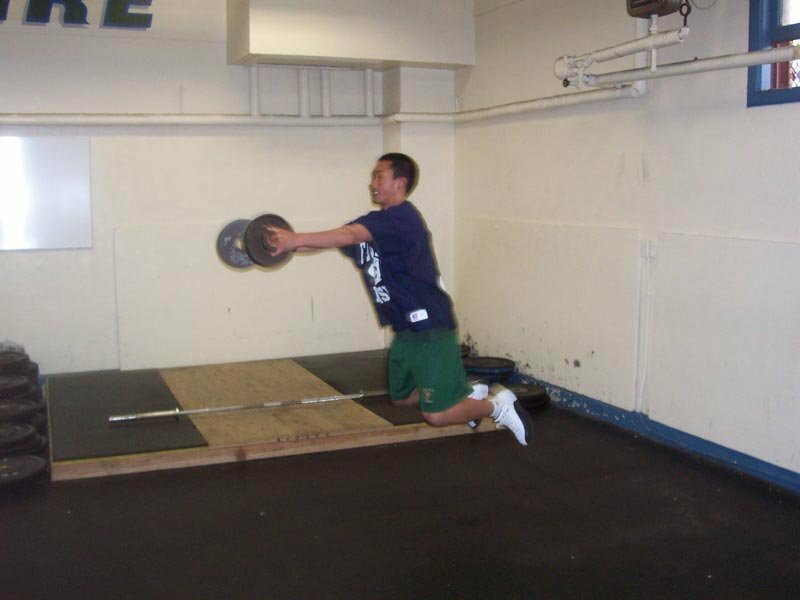 It’s a great measure of single leg power, much better than the single leg vertical jump or horizontal jump. 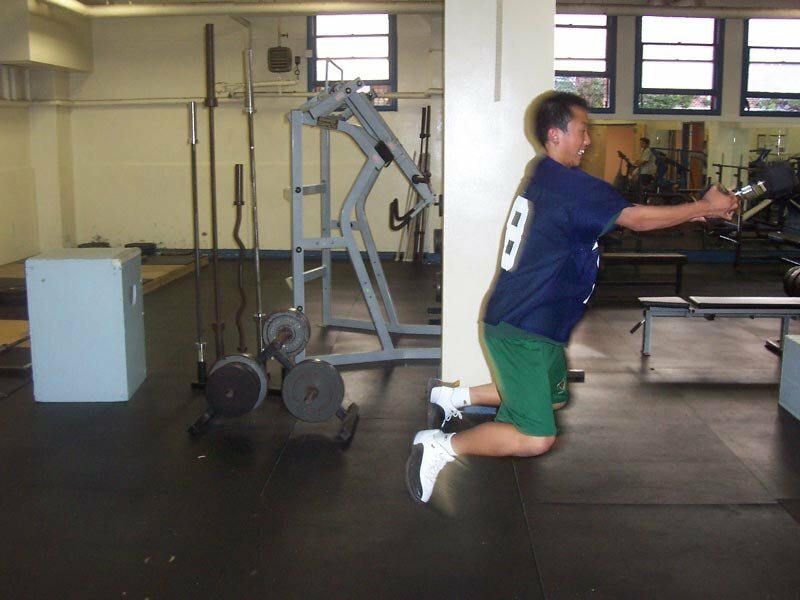 This is a great exercise to prepare the body for bounds or depth jumps. This exercise can be performed for 2-3 sets of 4-8 reps. Starting position: This exercise is just like the hang clean except it’s performed with a finger grip. 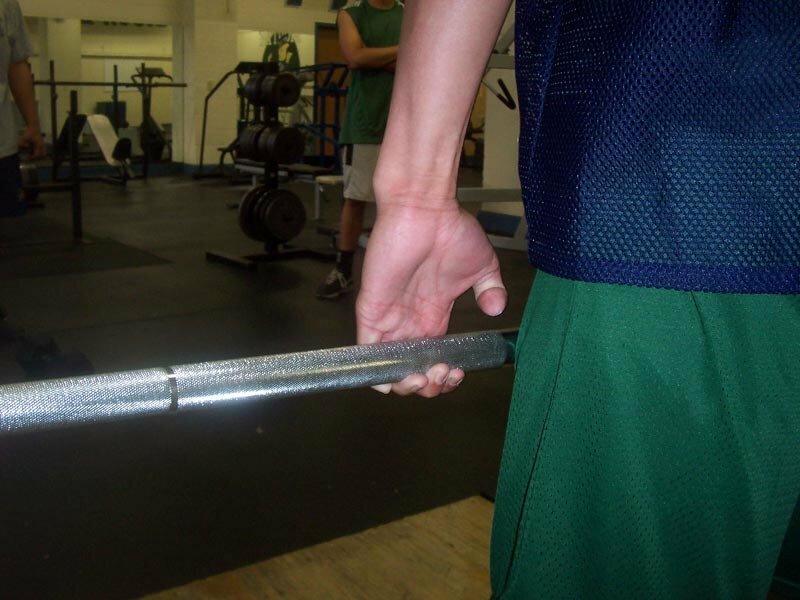 Hold the barbell with only your fingers, release your thumbs and open your hands. 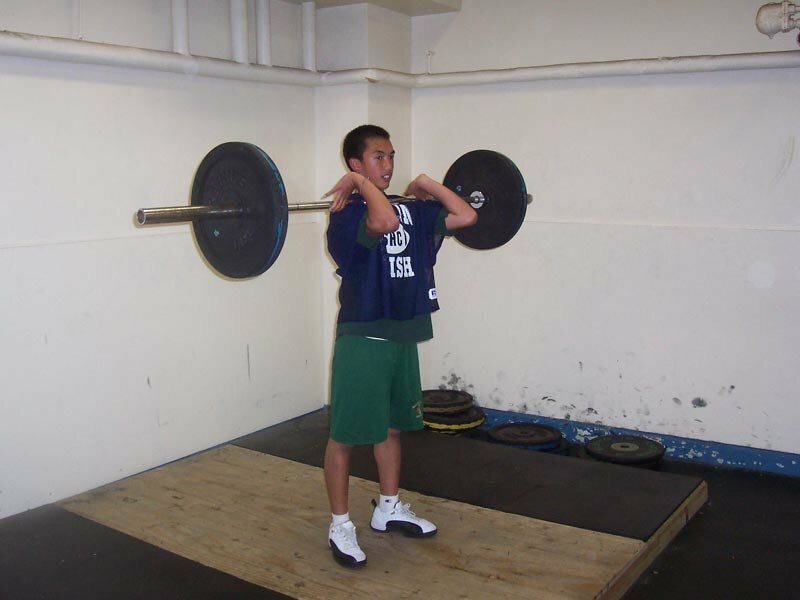 Stand up right with the barbell. Execution: On the descent keep your knees in the same place. Do not allow the knees to travel forward, let the bar go straight down as the legs are pushed backward out of the way of the bar path. Let the bar travel down to the level of the knees, keeping the lower back flat. Now, forcefully extend the hips, knees and ankles, but do not allow the arms to lift or bend. A level of attainment or achievement in weight loss or bodybuilding where one gets “stuck in a rut”, barring further progress or noticable results. As obvious as it may seem, if you continue to do the same thing, you will continue to get the same results. Click here for tips on breaking through plateaus. 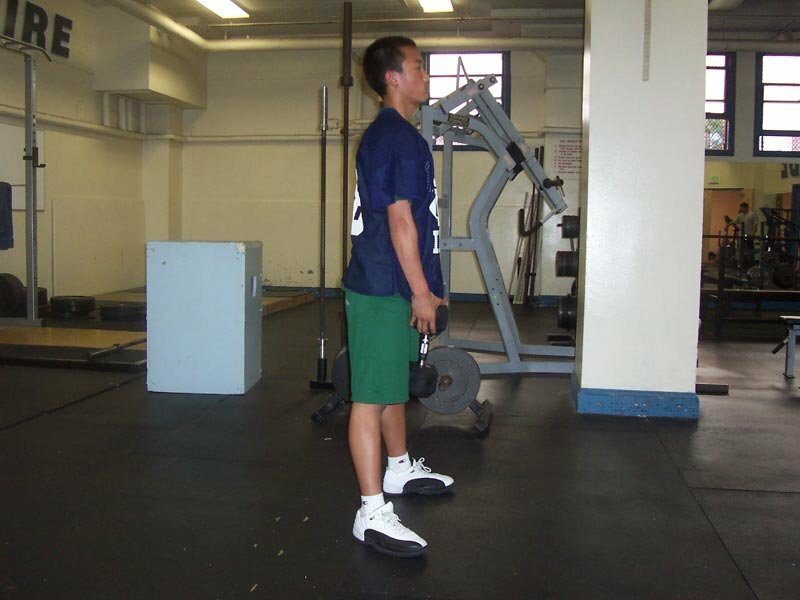 Starting position: Take a shoulder width stance and point the toes straight ahead. Hold each DB up to your shoulders with your elbows pointing straight ahead. Allow one end of the DB to rest on each shoulder. Execution: Drop straight down a few inches and forcefully jump and extend up. Then, as quick as you can, drop straight down into a lunge position. One leg should go forward and the other goes straight back. Catch the weight with your arms fully extended in the bottom position. Stand up with the arms extended until you are upright, take small steps up. The arms should be fully extended and behind the ears in the catch position. This exercise is all about getting down quick. Anytime you see “jerk,” it means get down quick, not push up. The momentum of the jump should get the weight going up; the rest of the exercise is about getting underneath the weight before you catch it. This exercise can be performed for 2-4 sets of 8-10 reps. Execution: Take a barbell across your shoulders with one foot forward and the other foot backward. Allow your knees to bend slightly and quickly switch foot positions with a little jump. Switch foot positions back and forth quickly and forcefully. 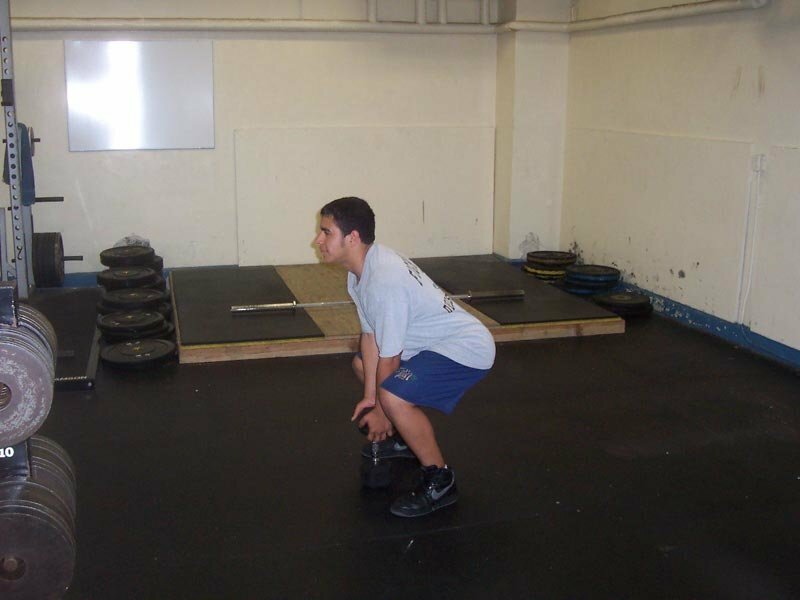 Starting position: Get in a half squat position with your arms in front of you. Execution-from this static position, jump up and onto the box. You want to jump from a still position, do not allow any counter movements. Land in the middle of the box and stand all the way up. Reset after each jump. Execution: This exercise is actually two jumps. 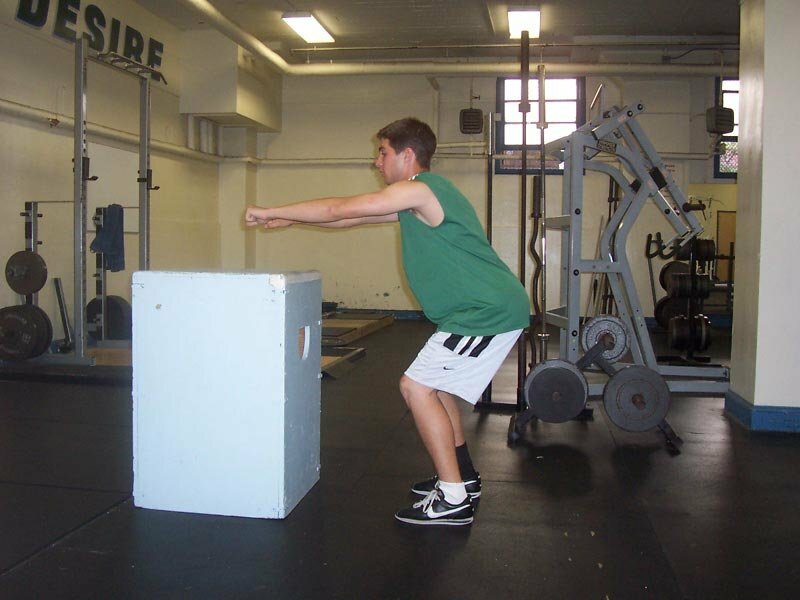 Start away from the box and perform a horizontal jump to the box. Upon landing, as fast and as hard as possible jump up onto the box. This second jump needs to be as fast as possible, you can think of the ground being on fire and you need to get up quick. Land softly in the middle of the box and stand upright. Reset after each jump. This exercise is a stretch-reflex exercise, but it’s not as intense as a depth jump. It’s a great exercise to prepare for more intense jumps. This exercise can be performed for 2-3 sets of 4-8 reps. The high school volleyball team that I train has added an average of 5 inches (15.5 inches to 20.5 inches) to their vertical jumps in two years. 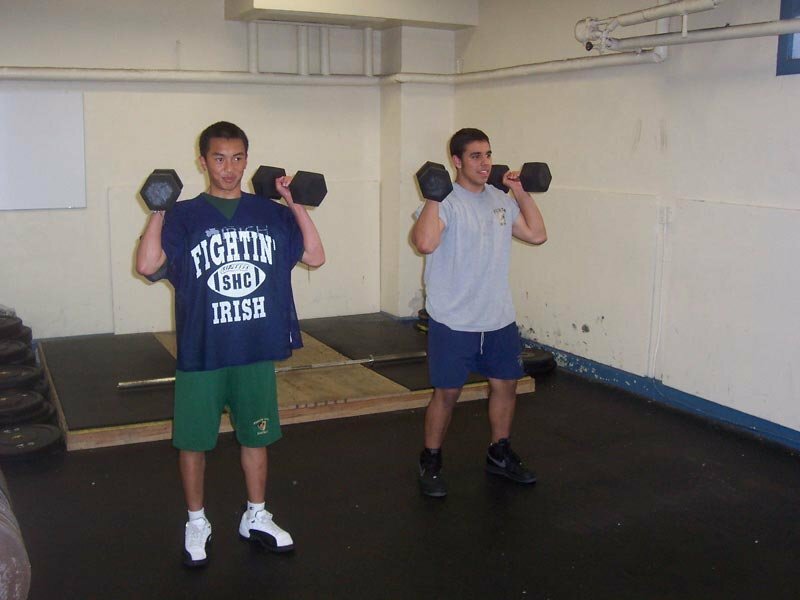 They went from a pretty good program to the Northern California Champions (Div 3) in 2004. It was an impressive feat considering our middle blocker was 5-foot-9 and we didn’t have a single player over 6-foot-0. These exercises will help any athlete run faster and jump higher.